My name is Filippo and I was born and raised in Calabria: I harbour an unconditional love for my homeland, which is the driving force, together with my innate passion for photography, behind my desire to celebrate it through my pictures and videos. Calabria is a land rich with enchanting places able to touch the hearts of everyone: I still ask myself why, when standing before certain landscapes, I am so filled with emotion as though for the very first time. Among the many qualities of my homeland, the greatest are certainly its biodiversity and the closeness of the mountains to the sea, offering tourists a vast choice of places to visit: from Sila National Park, it is easy to reach the different coastal localities that look out over both the Ionian and Tyrrhenian Seas, passing through medieval towns and much more besides. It would be impossible to tell you all about Calabria in one article, so I will start by talking about the Ionian coast of Catanzaro, my home city, an area I have known since I was a child. Before immersing ourselves in this brief photographic journey, I cannot go without mentioning my equipment. I like things to be easy and to have everything close to hand but, given that I often venture into remote and hard-to-reach places, I need something that is resistant to bad weather and of limited weight. For a question of weight, I use a mirrorless camera combined with two lenses and an action cam with relative accessories, so I need a comfortable and versatile backpack for my equipment: for this reason, I chose the Off Road Hiker backpack by Manfrotto. 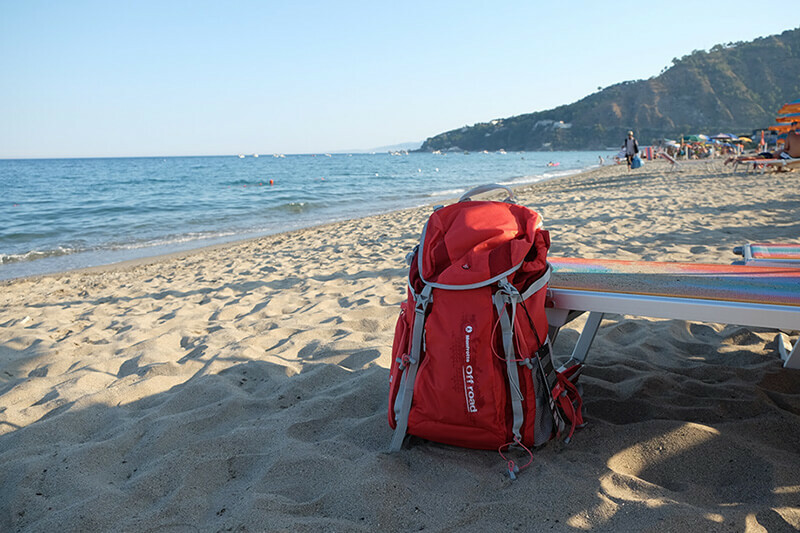 An essential feature of this backpack is that it is water-repellent and resistant to humidity: this makes it particularly useful in places that are very humid or close to the sea. You’ll probably have worked out that I like to explore… This backpack is truly perfect for me. Our brief journey begins in the locality of Caminia, a true paradise on earth. Caminia is a little stretch of sand set between two cliffs, which, surrounded by the hills above, turns out to be a naturally guarded treasure. 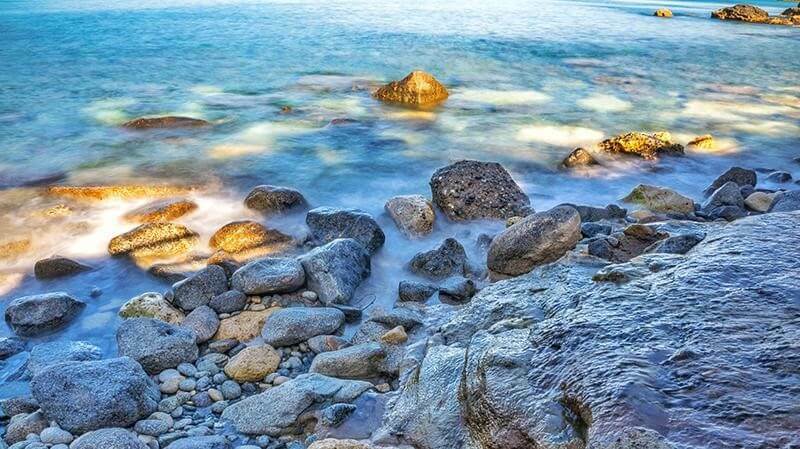 The cliffs house caves that are deemed to be sacred, surrounded by evocative tales, whilst the crystal-clear sea that laps on the shore provides a great sense of harmony and peace. 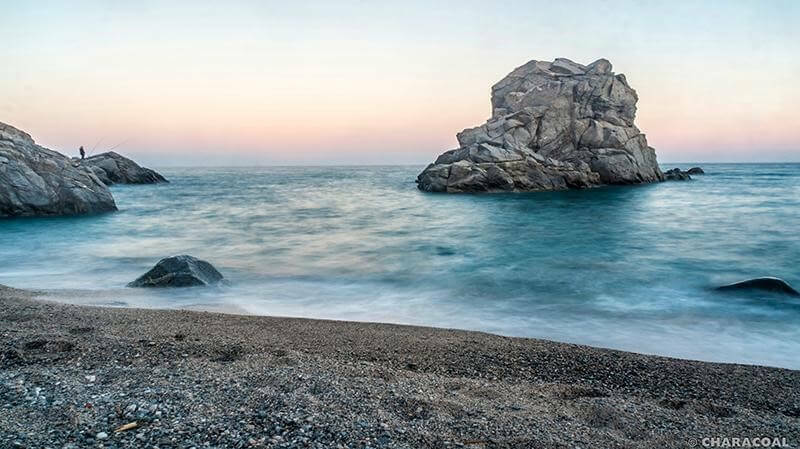 Another very evocative place is found close to the Scoglio di Pietragrande in the municipality of Stalettì. 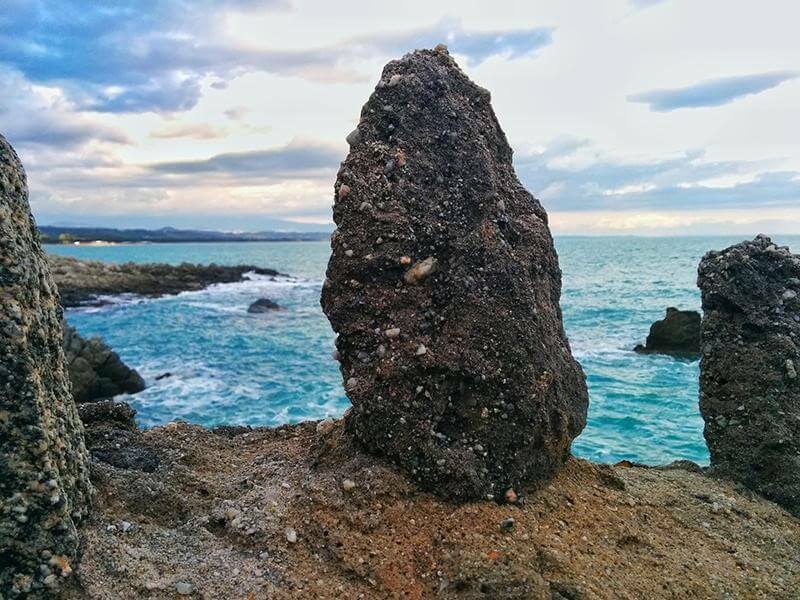 This place is famous precisely for this great rocky mass that is found just off the coast, perfectly in harmony with the typical landscape of this strip of land that stretches from Copanello to Caminia. I particularly love this fantastic place at sundown because the play of light and colours that are created with the sky and the sea leave me speechless with wonder. 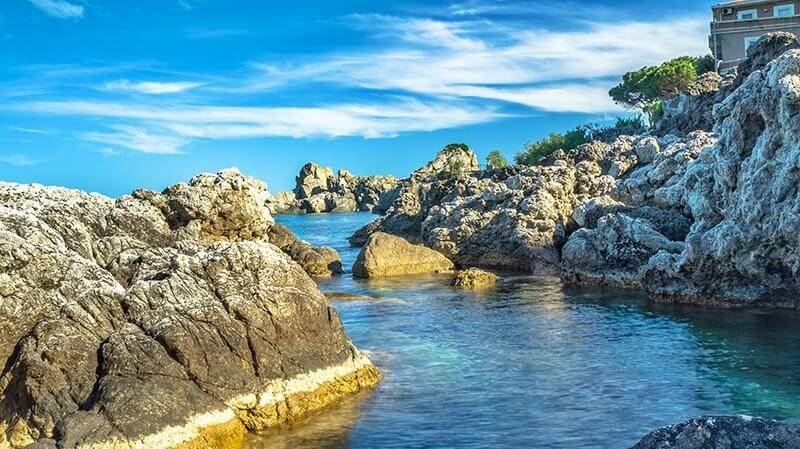 Another amazing landscape, rich with history and nature (again, in the municipality of Stalettì)is the stretch of coastline known for the Vasche di Cassiodoro (natural pools) and the famous Blu 70, nightclub that looks directly out over the water. I really love this place for the peace it brings me. In my opinion, it is one of the most under-valued places in my home region, given that it is almost abandoned, despite it having a breathtaking sea floor (whilst I mention it, I recommend going snorkelling to observe the many marine species that are found there). It boasts great historical importance, thanks to the events surrounding Flavio Magno Aurelio Cassiodoro, its natural pools and the remains of the Church of San Martino (a tiny place of worship with a single nave, believed to hold the remains of Cassiodoro’s tomb). The Vasche di Cassiodoro form a very evocative place: bathing amongst the granite rocks and swimming in the clear blue water in the knowledge of the place’s great history makes it a unique experience full of significance. 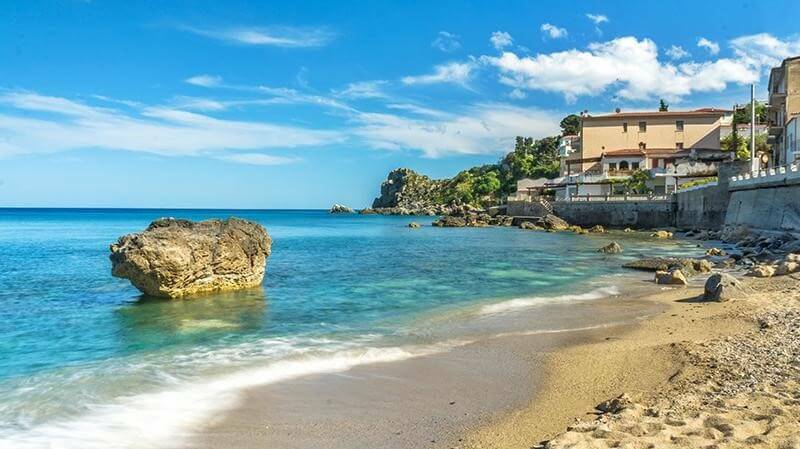 There is great regret in seeing this place practically abandoned to itself, when it could instead be one of the main tourist destinations for visitors to Calabria. My brief journey along this stretch of coastline ends here: I hope to have passed on to you my passion for my homeland and I invite you to visit my social network channels to discover my project on Calabria (click here for the teaser). Until my next article, which I hope to write soon, given that I have so much more to tell you! Born in 1992 in Calabria, an Italian region that is capable of making you fall in love with nature in its every form. I am a university student and I always try to devote as much time as possible to my passions in life: photography, music and hiking. I love to explore and to discover new places; often, you don’t need to travel far to find places that take your breath away. My aim is to reach the hearts of those who look at my photos and to promote my homeland by experimenting different photographic techniques, including using action cams. Follow me on my journey.